Looks like things aren't rare anymore, but beyond rare. Mostly posting because of title and tone of item description making me chuckle. DOES THIS MANNER OF EXPLAINING THINGS MAKE YOU MORE AMENABLE TO ACTUALLY COUGHING UP THE MONEY AND BUYING THIS KEYBOARD? IT IS, AFTER ALL A NEW IN BOX, BEYOND RARE, UNIT, OF AN UNCOMMON KEYBOARD LAYOUT AND AS SUCH IT QUITE DESERVES THE EXTRA ATTENTION AND EXTRA MEASURES TAKEN TO ENSURE THIS EXTRA ATTENTION IS TENDED TO BY ALL THE POTENTIAL BUYERS, YOU YOURSELF INCLUDED. Also, check out the keyswitch! Yes it almost makes feel OBLIGATED to buy this board because HOW CAN YOU LET THIS OPPORTUNITY TO BUY THIS INDEFINABLY BEYOND RARE KEYBOARD PASS YOU BY? YOU SHOULD FEEL ASHAMED FOR NOT BUYING THIS KEYBOARD! 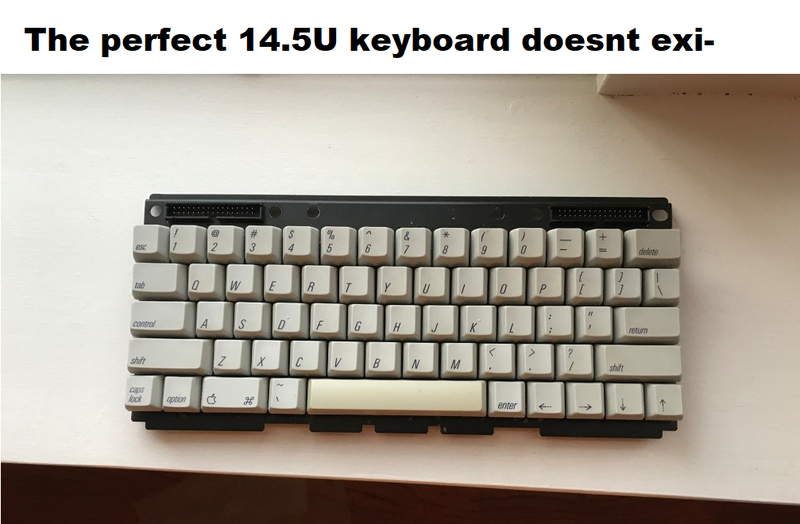 That, kids, is why good keyboard design does NOT reduce a keyboard's width from 15U to 14.5U by shaving 0.5U from the right side — while 1.5U Backspace keys are bearable and 1.75U "thin ANSI" keys are not bad, the ISO Enter key becomes an "anorexic ISO" key that is inexcusably uncomfortable. okay I have to ask, where is that keyboard from? 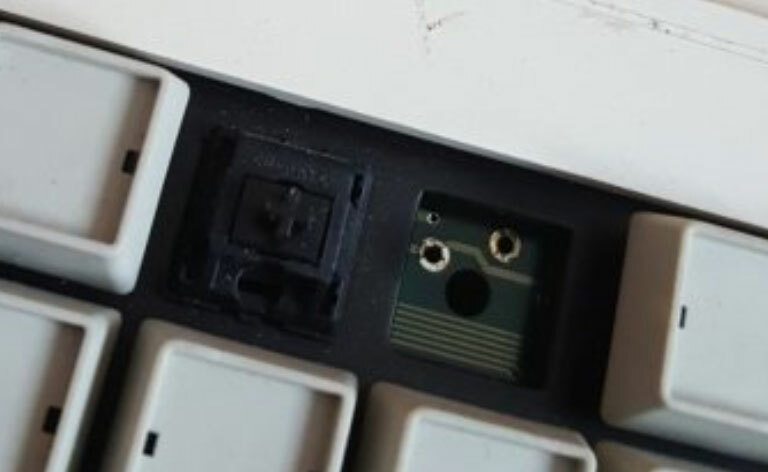 It looks like the IIc+ keyboard assembly but with a regular sized enter key instead of the weird L shaped one. thats definitely up there with M0118 layout tied for my ideal layout. arrow keys and everything. I MUST KNOW!! ah, of course. the one layout that rivals that of the m0118, and its even more expensive to procure. shouldve known. I found this vintage Devlin keyboard. It has vintage cherry mx browns and it seems it has ABS keycaps. Wondering is it worth anything? It's from a Macintosh Portable! Is it worth to consider changing keycaps or it is better to preserve it as it is. This model seems very rare. I couldn't find anything about it anywhere. Similar models yes but exactly this one no. 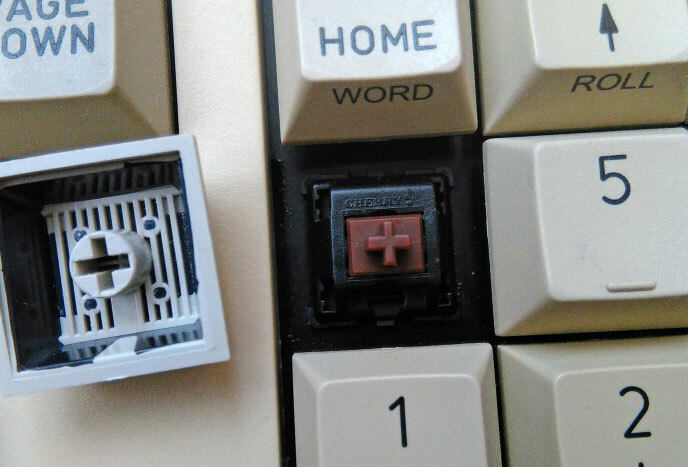 the keycaps are probably the best aspect of it, I don't recall which exactly, but I've seen this lock light sticker on some other cheap rubber dome/mechanical keyboards, it's a nice piece of collection and I'd be glad to be able to read more about it, so it would be cool to be documented. Lock light sticker looks like Monterey K208 and late K104. Arrow keys look to be swapped horizontal for vertical. 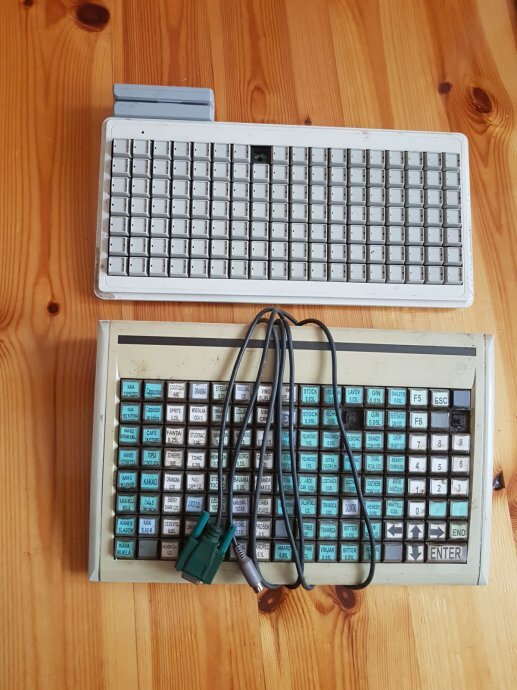 Can anyone estimate age of these Tipro terminal keyboards, I am wondering are these vintage cherry blacks or not? Both boards seems cheap, 20 euros each? One is K160 M2400 model and other one being KMX 128A. Even if they're not vintage blacks 40 euros is a steal for the pair. If you could get that image in larger resolution you could perhaps see if those switches with missing keys are Cherry MX switches. To see whether they are vintage or not, you would have to get a lot closer: to determine if the Cherry logo is in an older or newer style can be difficult even with a naked eye. https://www.ebay.com/itm/Vtg-Dell-Mecha ... 0005.m1851. For a while I was seeing these at well over USD200. Did they do pad-printed caps on these boards? Several keys lost their legends. There's ones with pad-printed caps, and others with dye-sublimated legends. I'd love to get a scan of this as a desktop wallpaper. Ciba-Corning EKT-101. I couldn't find anything in the wiki for this board or its switches, but I'm leaning toward Foam and Foil or dome with slider. Here's a picture of the switch that the seller PM'ed me. I've asked the seller to see if a digital option is available so we can have a better quality version. Given the big size just a little retouch for the damages or "photoshop" in another selectric are pretty easy to do. I'm on the same boat.